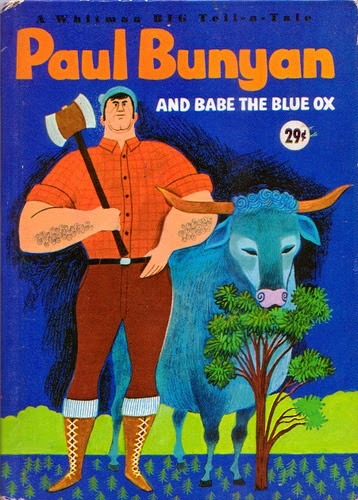 Most of my friends are old enough to remember Paul Bunyan and his blue ox, Babe. They have drifted out of popular culture these days but I think that this winter has been cold enough to reprise them. Paul Bunyan was a giant of a man, an amazing lumberjack, always accompanied by Babe. He lived mainly in Minnesota but had travelled extensively throughout the northeastern States, probably causing havoc with that gigantic beast and huge ax of his. My favourite story is the one of the very cold winter. It was so cold that when people spoke out of doors, their words froze. When the weather got warmer, no one could even hear themselves think, all because of the thunderous noise caused by all those words thawing out! Like this morning. I shake my head at those 'good old days', remembering the wood stove, icy feet, inadequate winter wear. It was cheaper to heat than insulate way back when. A lot of houses were insulated with newspapers; no wonder they burned down so quickly! Conventional wisdom decreed that our coats should be heavy; I'm sure a lot of you remember those 50 lb. garments. And boots! Rubber galoshes with not a warming particle in them. There are days when I secretly worship at the altar of Enbridge; do people really know what it's like to heat with wood? Chopping aside, what about the dirt? the bugs in the house in January? and last but not least, the burn injuries? Never considered that, didja? An MD in the North did a study......lots of burn injuries. A realistic compromise must be out there, somewhere. What if we pay just a little more as long as the money goes to infrastructure? Safer pipelines and all. I like to be warm; I like my water lines to not be frozen and I'll bet all of you do, too.